Check out our fun facts for kids that feature interesting trivia, quotes and information related to a range of famous scientists. Stephen Hawking is one of the most famous scientists of modern times. Despite his challenging physical impairments, he has contributed much to the world of science, helping spread his ideas to the general public with the release of accessible books such as ‘A Brief History of Time’. Read on for interesting facts, quotes and information about Stephen Hawking. Helped by the success of his book ‘A Brief History of Time’, Hawking has released other books aimed at making his work accessible to a wide range of people, these include ‘The Universe in a Nutshell’, ‘A Briefer History of Time’ and ‘George's Secret Key to the Universe’, a children’s book with a strong focus on science. Hawking has worked extensively on the subject of black holes, providing theories for their behavior, including the idea that they emit radiation. 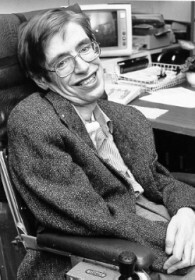 Hawking suffers from amyotrophic lateral sclerosis, a type of motor neuron disease that has left him almost completely paralyzed.